In Ecuador’s capital city, Quito, modern jostles with the ancient, the spiritual confronts the secular, and the quiet and peaceful tempers the lively. Many people use Quito as a stopping point on their way to the Galapagos Islands or the Amazon Rainforest, but Quito is worth a visit in its own right. Here are five fun things to do in Quito, Ecuador. Quito is widely acknowledged as one of the best preserved colonial cities in the Americas. It was the first city in the world to be named a World Heritage City by UNESCO, in recognition of its beauty, architecture and culture. Quito’s Old Town has undergone a major transformation in the past decade and you’ll want to suss out the unique buildings and plazas laced throughout it. Ecuador is recognized as one of the best cocoa producers in the world and there are several chocolatiers to sample near La Ronda Street. You can also find artisan shops making wooden toys and other handicrafts. 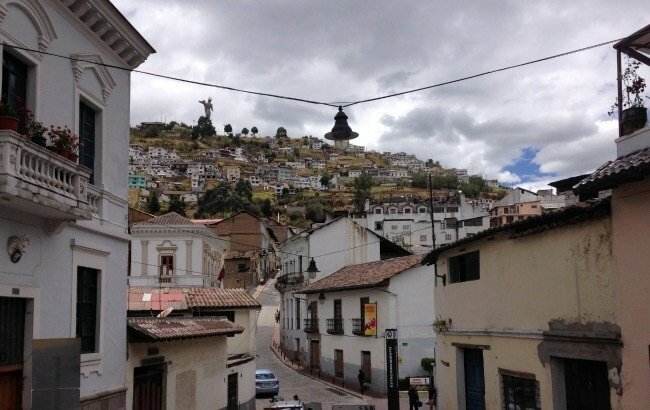 Quito is home to some 60 churches, chapels, monasteries and convents. Over half of them are situated in the historic center. Even if you’re not religious, it’s worth going inside a church or two to be wowed by their scale and grandeur. Many are filled with rich tapestries, oil paintings and sculptures. Churches in North America and even some of the most famous ones in Europe just aren’t on this scale, in my opinion. 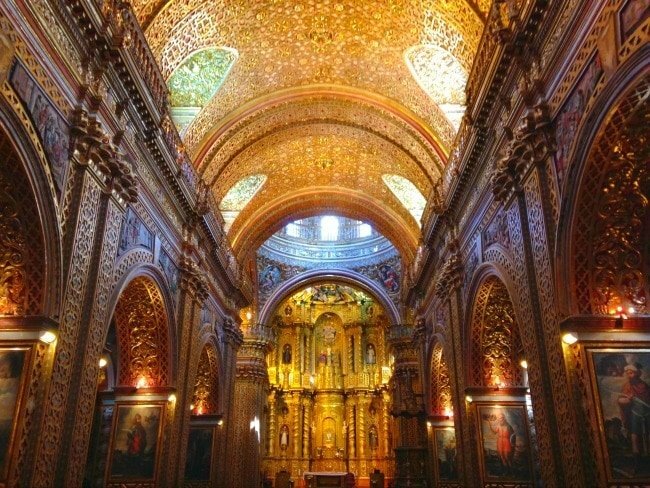 Over 35 pounds of gold leaf was used in the interior of Compania de Jesus, a church known as one of the best examples of the baroque style in Latin America. Don’t miss San Francisco, the city’s oldest church, which was built on the same spot as an Inca sun temple. You can’t go to Quito without visiting the equator, less than an hour’s drive away. But which equator should you choose? At Mitad del Mundo (which translates as the middle of the world), you’ll find a simulated Andean village filled with shops and restaurants. Be sure to pose for a photo in front of their equatorial monument as proof of your visit. This is the spot long known as the location of the equator until GPS proved otherwise. It’s worth a visit, just don’t be fooled. About a five-minute walk from “the old equator,” is Museo de Sitio Intinan, where the real equatorial line sits. I highly recommend the fun and informative 45-minute tour in English. Guides take you through authentic Amazon jungle homes built by the Wuaorani tribe and you’ll get to learn all about the shrunken head ritual that was once conducted in the Amazon. The best part takes place at the actual equator, where you can try to walk the line (the gravitational pull makes it super hard) and conduct fun experiments like balancing a raw egg on a nail. The sun is intense along the equator so be sure to bring a hat and sunscreen, even if it’s a cloudy day. Try to arrive before noon to avoid the afternoon crowd. Don’t forget your passport if you want a stamp from the equator! History buffs who want to learn about Ecuador’s past and culture will want to visit Museo Nacional de Quito. The museum, however, is a snoozer for kids. 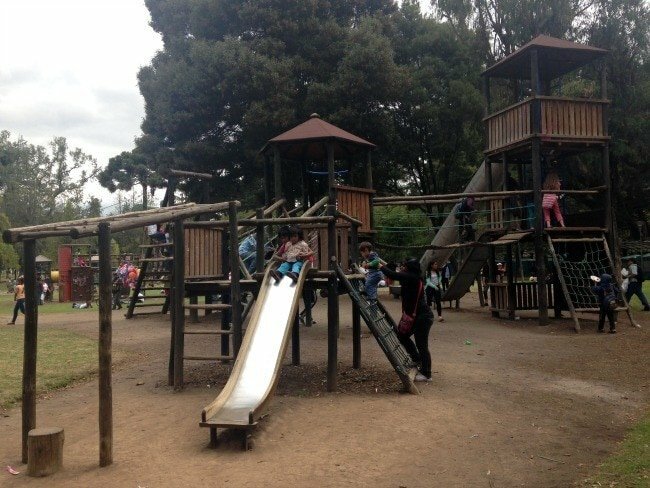 Thankfully right next door families will find an amazing and massive park, Parque El Ejido. Plan to spend a couple of hours exploring the park’s numerous playgrounds and strolling through this lovely tree-lined oasis. Rent bicycles, tricycles or plastic play cars and let the tykes cruise around the plazas. Mesmerizing street artists gussy up the sidewalks with beautiful temporary works of art. Don’t worry about bringing a picnic to El Ejido Park; loads of food vendors peddle tasty treats here. (I sampled offerings from several of them and never got sick.) If you’d rather eat a sit-down meal, make the short walk to Plaza Foch, a trendy neighborhood filled with western restaurants. Let me explain. Quito is famous for their Good Friday Easter procession during which Cucuruchos (men wearing hooded purple robes) carry heavy crosses and walk barefoot through the old town. 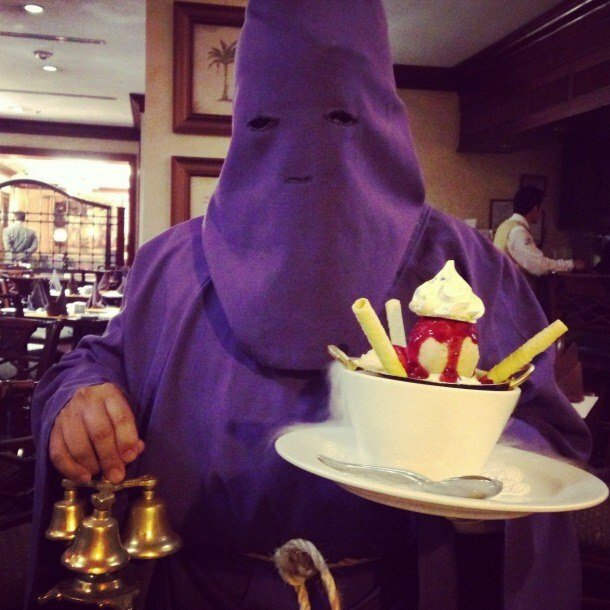 Admittedly these robes look alarmingly similar to the ones worn by the KKK, but you have to remember, this tradition is much older than that group of racists. 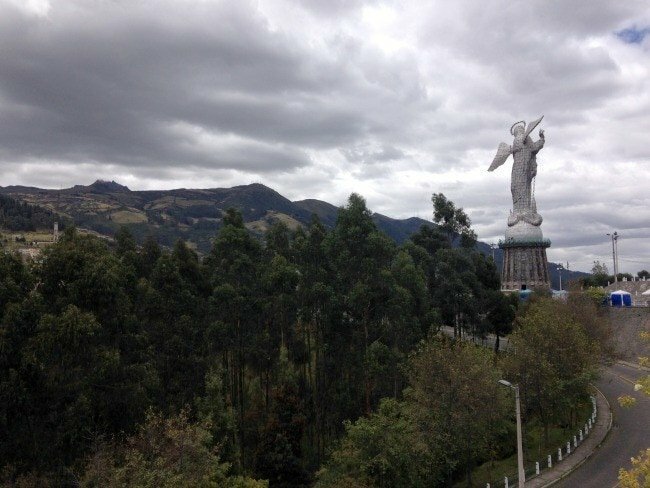 Like many South American cities, an iconic religious monument towers above Quito’s citizens. It’s worth a visit to Panecillo Mary (the Virgin Mary) for the incredible view of the city and surrounding volcanoes. Sheep graze near the statue, adding to the charm. A mini-market sells handicrafts, hot chocolate and local snacks. If you arrive around lunch time, have lunch at Pim’s. Less than a two-minute walk from Panecillo, this restaurant boasts incredible views and a menu of traditional Ecuadorian foods. Their ceviche is quite good, as is the fish. The best part? 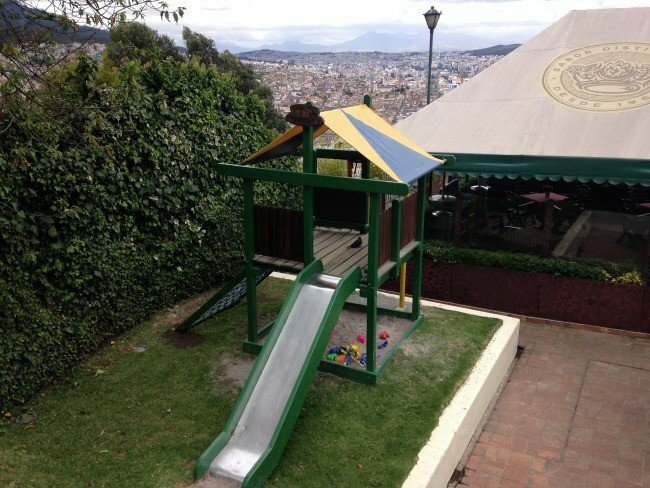 There’s an outdoor children’s play set! Wondering where to stay in Quito? I was smitten by Las Casona De La Ronda in the center of the city’s historic district. This boutique hotel is mere steps away from lively restaurants and bars, artisanal shops and chocolatiers. There are plants everywhere, ivy snakes up the railings and wherever you look, you’ll spot either artifacts, murals or exposed brick. Have you ever visited Quito? Is standing on the equator on your bucket list? Let us know in the comments below! 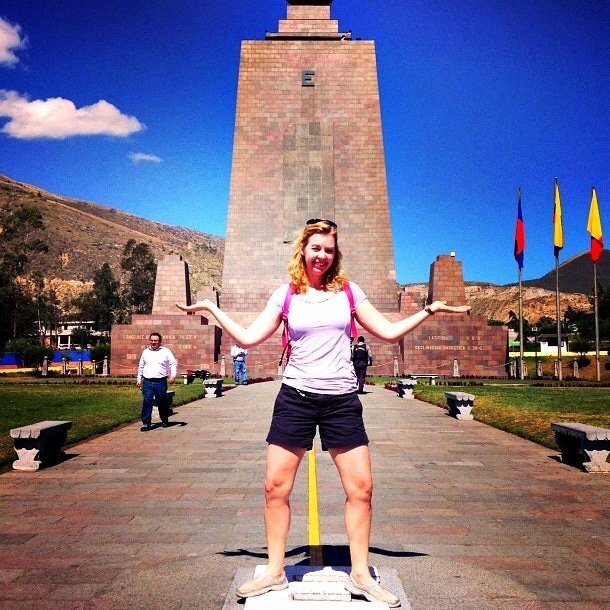 A Note from The Saucy Travel Mama: Thank you Quito Tourism for hosting my visit. As always, my opinions are my own. My father is Ecuadorian, and I lived there for 20 years! I love it there, and am so proud of how the tourist industry has so take off…thanks for a wonderful article…. Thanks for stopping by, Tanya! Taking the Tren Crucero from Quito is a great way to see more of Ecuador by luxury train. I agree! I actually did take that train and it was one of our best days. Oh my, it is! I’ve updated the post. Thank you for pointing out our mistake! Nice post! I know it’s been a while since you posted but most recommendations are still relevant today, actually! I would only suggest adding Capilla del Hombre (https://www.bucketpass.com/capilla-del-hombre-art-museum-quito ) as this is a very unique place in Quito where you can see Oswaldo Guayasamin’s most extensive art collection and the house where he passed away. Guayasamin is known as Ecuador’s most important plastic artist in history and is very well-known around Latin America and the World. Capill del Hombre is truly a gem everyone should visit. I loved your article about meeting up with other families while traveling. We have twin daughters (11 years old) and I am planning a trip to Ecuador and the Galapagos Islands and I would love to figure out how to connect with other families with children about the same age to “parallel travel” with. Do you have any tips about how to connect with or find other families interested in traveling to Ecuador?